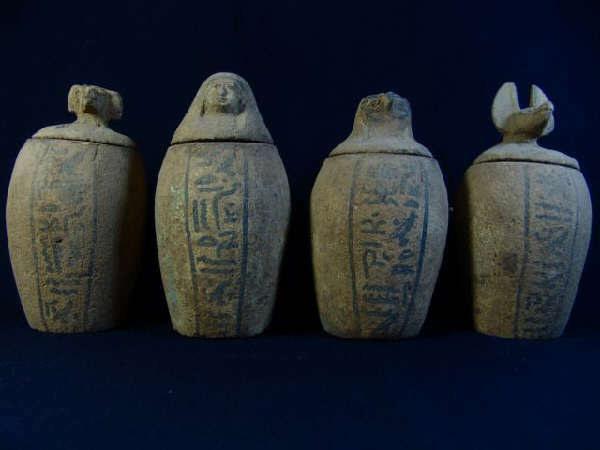 Ancient Egyptian "Complete Set of 4 Canopic jars"
The above listed items are from the Late Period,(715-332 B.C.E. 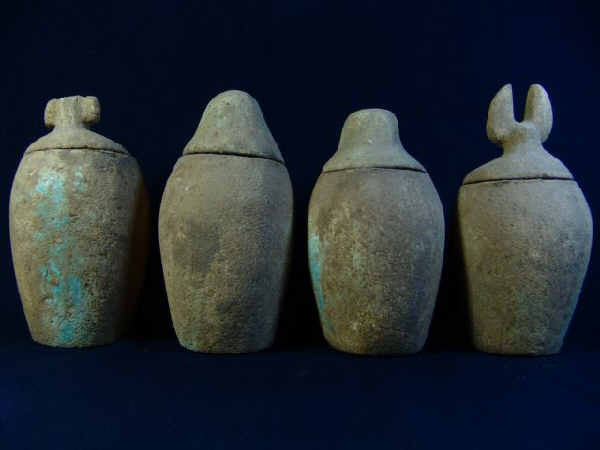 ), These four "Canopic Jars" were clay cast, thrown, detailed in black paint and at one time glazed, now worn. We acquired these incredible pieces from a select private collection and their provenance is from Alexandria, Egypt. Depicted are the four sons of Horus that were guardians of the dead. The Canopic Jars listed have the heads of "Qebeshennuf" the falcon, "Duamutef" the jackal or dog, who guarded the stomach; "Hapy" a baboon, who protected the lungs and "Imsety" the human headed son, that guarded the liver. On the containers there is downward row of hieroglyphics on each jar and some have traces of blue faience glaze. These jars are intact with ancient age wear. The reason for the item being available is due to the vast extent of archeological findings, thousands of years in Egyptian burials and also the proliferation of these said items in older private collections worldwide. Our ideal is to offer our customers every opportunity to acquire an Egyptian anitquity without the high end gallery price tag. Know that we stand firmly behind all of our fine products, guarantee and easy return policies. You have nothing to lose so, Bid with the Utmost Confindence!"